Delhi High Court invites applications to recruit staff in Delhi Judicial Service to fill up total 50 vacancies by conducting Delhi Judicial Service Exam. All eligible candidates should apply from 31.01.2018 – 15.02.2018. Check the eligibility criteria, selection procedure, job description & other details of Delhi Judicial Service Exam 2017-18 given below. Age Requirement : Maximum age should be 32 years as on 01.01.2018. Upper age limit should relaxed to 5 years for SC/OBC. Age relaxation is also provided for various categories as per govt policy. 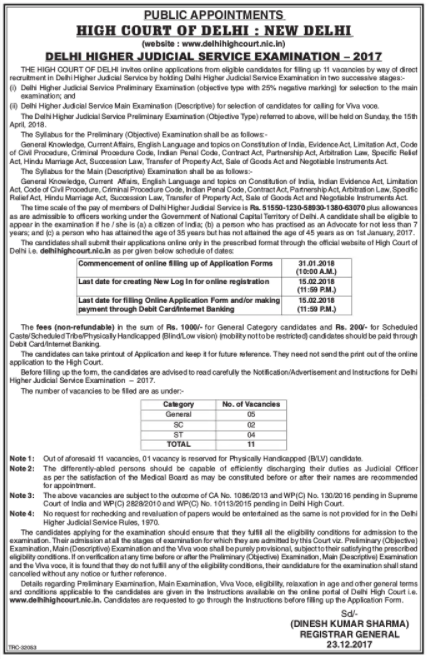 Eligible candidates should have to apply through official website www.delhihighcourt.nic.in before 15.02.2018. Please ensure your eligibility before apply through official notification from below.